Orange Flames Fleece, a versatile plush fabric, can be used to create crafts, hats, gloves, and more. Fleece is optimal for no sew projects because the edges do not fray. Making blankets for children's hospital. It fit what I needed, to line a crochet blanket. I have had many request from my nephews that they want a blanket next Christmas. I do like your fleece fabrics. Every year my brother goes to Burning Man. This is perfect for a man’s pullover hoodie! Making no sew blankets for my brother in law to use during chemo treatments. daughter is volunteer fireman........had to go with the flames !!!! To be able to match a motorcycle fleece fabric for a blanket. To go with another fa bric abd your price was the best! I liked the flame print. Perfect for the reverse side of one of my "team blankets" that is orange & black! To make a blanket for my son. It was his choice and hard to find locally. FEROCIOUS FIGHTERS is an incredible organization that helps children newly diagnosed with a horrible disease, the most painful disease known to man. This is to help them. Please visit their page to learn more & see if you can help these kids !! Is this orange flame fleece anti pill ? Great fleece for quillows and the colors/pattern are perfect!! This is for my son. Me and my sister made the no sew blanket. Together we have made 8 for my kids.The material was easy to work.Would recommend this company. The only disappointment was waiting for the fabric to come in. I will order again. This is what I did with the flame fabric. 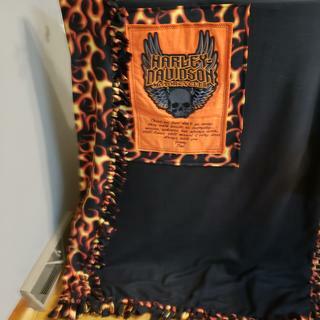 Beautiful Harley Davidson personalized blanket. Great fabric, loved how the tie blanket turned out.